Note: While this review will be spoiler free, it does reference events from previous books in the series. If you haven’t started yet, check out VBC’s review of book 1, Dead Witch Walking. I remember when I found Dead Witch Walking in the fiction section of my local bookstore back in 2004. On the cover there was a quote from Jim Butcher, “Blends the best qualities of Anita Blake and Stephanie Plum…” and I was immediately sold. Now here we are on book 13, the final book in The Hollows series. Over the years I have developed a deep affection for Rachel Morgan, Ivy, Jenks, Trent, and all the other inhabitants of Kim Harrison’s Cincinnati. So reading The Witch with No Name was bittersweet. In the first few chapters Ivy is mortally injured and Rachel races to determine if she will be able to save Ivy’s soul. At the same time the vampire hierarchy is finished waiting for Rachel to find a solution to the vampire soul dilemma and renege on their protection. Also the elves put into play their own plan to overthrow the supernatural power structure. From page one of The Witch with No Name, Rachel and friends hit the ground running, and the reader isn’t allowed to relax until the epilogue. The common theme throughout The Hollows series is growth. The growth that Rachel goes through from Dead Witch Walking to The Witch with No Name is epic and organic. She begins as a semi-talented earth witch then to a powerful ley line witch and then finally a day-walking demon. She doesn’t even quibble anymore about calling herself a demon, where before she would argue it was simply a technicality. Also her love life was completely relatable (in a sense). She dated the bad boy, the bad boy with a heart of gold, the older man, the convenient guy and so forth. She was no different than the reader and we were able to commiserate with her all the way. The growth wasn’t only limited to the main character, but also every person in Rachel’s circle. I highly doubt that Ivy, Trent, or even Jenks from the first book would even recognize themselves now. In the final book that all the small story arcs within the series come to a climax and the devoted reader finally gets the payoff they were waiting for. This is not a book to pick up without having read the entire series. 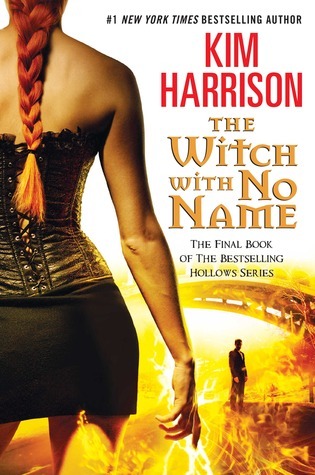 I have to say I really enjoyed The Witch with No Name. At times it was heavy and detailed, but that comes from being the conclusion novel. I wasn’t left with unanswered questions and with the epilogue we get a quick peek into the gang’s future. It was honest and truthful to the characters we have come to know and love. In total, it left me with a smile on my face. So bravo, because this has to be the best conclusion I have read in a long time. I have to disagree. Without giving too much away, I had plenty of unanswered questions, and I especially disliked how Rachel saw herself at the end of the book. And, the main events of the book left her in a unique position to be a strong influence on the reinvention of societies in both the ever-after and reality, and yet, she still feels like she is pulling Trent down. She could have been a powerful leader in her own right. And, the events at the end of the book would definitely get Trent kicked out of power, even if she weren’t around! I can’t say more without big spoilers. I also have to disagree but for a very slightly different reason. I was distressed that despite having had an apparently extremely happy and successful life, she was still reacting as though she was the “frivolous dalliance” that was going to be kicked to the curb (and worse yet – who deserved to be!). I would have hoped for more. That would have been a real HEA for me. I agree! I’ve not read many series that has ended (or I’m not caught up to the end yet) and I loved how this one ended. It was not 100% perfect but it was satisfying. I”m going to miss Al and Jenks the most. Book 13, I forgot to follow the series after I reached the end a few years back. I think the last book I read was “Black Magic Sanction”. I cant wait to start this series up again. Are book 9-13 as good as the one before them? I strongly disagree! Kim Harrison’s Rachel Morgan series was my introduction to the Paranormal/Urban Fantasy genre. I loved the first several books, but to me, this series gradually became a real chore to plod through. I kept up because of Kim’s promise of a Happily Ever After for Rachel, one that she deserved. HA! Far from it! I agree with you that the characters wouldn’t recognize themselves anymore because reading this book made me want to throw up! Rachel has completely lost her strength of character and is nothing more than a sniveling, hot mess! She may be a day-walking demon, but emotionally she is more stunted than she was in Book one. Being with Trent has made them both mere shadows of the rich characters they were in the beginning of the series. This final book, which I will admit I absolutely could NOT finish, was absolutely awful! It seemed to me that Kim Harrison just kept throwing things at Rachel and Trent to fill up space. Everything was so haphazard and seemingly unfocused. Giving this book one star is actually more than I think it deserved. After five days, I was just over halfway through it. This may not seem bad to some readers, but my history with this series had me reading an entire novel in one 4-5 hour sitting. I had a hard time putting them down, in the past, for even bathroom breaks! With this book, I could put it down and not even think about it, except for the fact that I had to get it back to the library! Kim Harrison has said that she is writing new books with new characters in new worlds, but I will not be following her to these new ventures. I will always appreciate her introduction to these genres, but I have since found many more, much better authors than her.